Here is the exclusive details of the most awaited multi-starrer of this year Devadas. The film has got positive buzz from US premieres and carried on its rushes today with housefull boards all over. 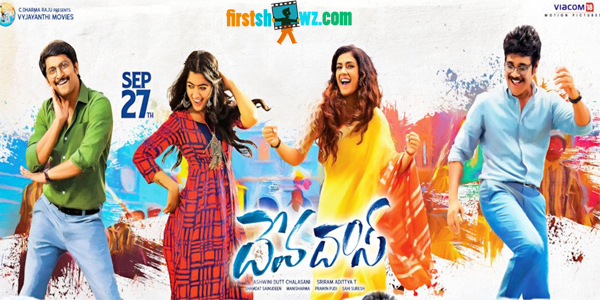 Devadas featuring Nagarjuna, Nani, Rashmika Mandanna, Aakanksha Singh is a visual treat to all classes and the director Sriram Aditya has got his pot filled with huge applauds. The film is produced under Vyjayanthi Movies banner by Ashwini Dutt and Mani Sharma composes tunes. We at firstshowz.com is able to give a chance for voting this film talk below.